Susan Morrow is an art gallery curator at an intersection in her life. Her marriage is crumbling and she receives a manuscript from her former husband (Edward Sheffield) of a book he wrote. As she reads the intense book of a family terrorized on the road, she reflects on their relationship, its blooming and disintegration, and his aspirations to be a writer. The opening sequences set a very stark visual tone with artistic images and compositions (of naked obese women dancing in slow motion), but unlike a David Lynch film, this is not maintained throughout, although moody architecture and lighting is employed in the slick, sterile real world, while the milieu of the story Susan reads has a more stark, dirty Texas badlands texture. 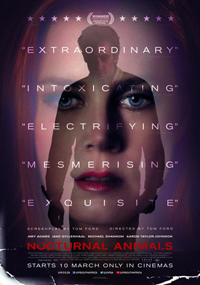 Ford manages to weave the suspense of the book she's reading in such a way that you question whether it is fiction or autobiographical, both the heavily inflicted main character Tony and its writer Edward portrayed by Gyllenhaal. Swirling in the world of creative fields, it glimpses at both its pretensions and substance, the bridge with Edward's book bringing a lot of this to the fore. Many a correlation can be drawn between the failed relationship and the tale unravelling in the book, the audience able to draw various analogous and metaphorical links. I'm not a keen follower of fashion trends or designers, but am naturally aware of various prominent names. I've walked past the Tom Ford store many times but never entered… This was the first time I heard of Ford and his branching out into filmmaking (although it has been seven years since his directorial debut with A Single Man, which until now, I never watched). Subconsciously I expected a far more visual / artistic film due to Ford's background, but he actually pays a lot of attention to story, character and the emotions flowing from it. Many designers and models become photographers, or like David LaChapelle verging into motion pictures from photography. We always expect people to stick to one thing, but in the creative and artistic fields these are malleable, just like musicians easily transitioning into acting.